Sunday morning came all too early. And Sunday morning meant getting the kids in something other than skeleton sweat shirts, and jeans with holes in the knees. Showers and hair braided, we headed out to a high-class restaurant for breakfast. What-A-Burger! Now the kids had frequented this place already, but I had skipped breakfast a few mornings. I’m not exactly sure why, but we all had a great time. The breakfast sandwiches were a little cheaper than Mc-y D’s, and the kiddos loved the pancakes. When we pulled into the parking lot, there were four police cars parked. Little Man was very excited because every movie that he has watched (think The Andy Griffith Show) the cops always are buying kids ice cream cones. Little Man was sure that they were going to buy him some ice cream for breakfast. 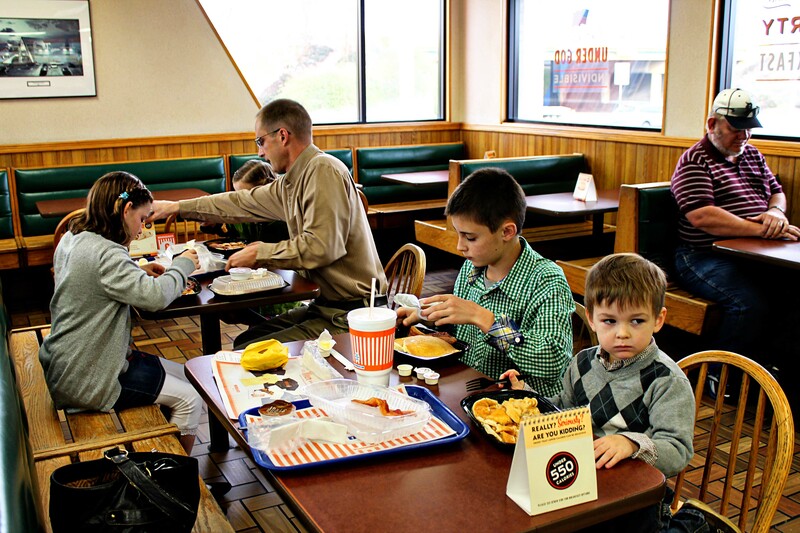 So when we walked into What-A-Burger, Little Man walked right up to them and said, “Hi!” and waved. All eight police man smiled back. Little Man then waited for them to buy him some ice cream. I explained that to Little Man, based on all the old-time movies he has watched, police men represent ice cream. Now every police officer there was either Hispanic or African-American, so they were not so familiar with Mayberry and Andy Griffith and Barney Fife. And their confused faces showed that they weren’t generally connected with buying kids ice cream. We were not in the best section of town, and in the middle of our breakfast, radios began making calls, and all 4 police cars left the parking lot with lights, sirens, and fast speeds. Little Man was disappointed because he at least wanted to get a picture with them. 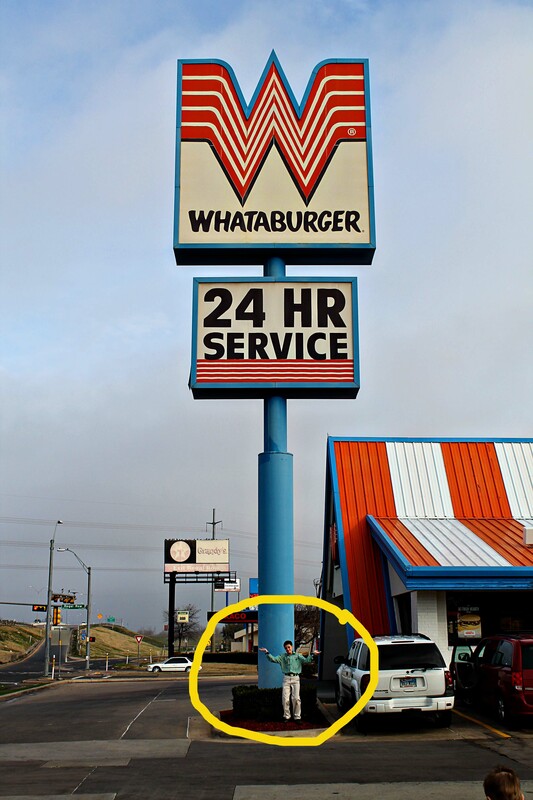 Clement is standing under the sign saying “Whatever-Burger.” We looked at our watches and realized that we were going to be late for church. No time to get a coffee, we needed to head out. We met Mrs. Herron, a lovely lady. She was thrilled we spoke Spanish, and we chatted away. Her Mexican food is legendary, but I was struck by her grace. She should be called Dona Dolores or Lady Herron. Isn’t she beautiful? Little Man found Reagan, and they played together the rest of the time. The only issue that caused problems is that Reagan REALLY wanted to share her lipstick, and Little Man REALLY didn’t want any lipstick put on him. Mr. Lyle took over and then they both happily played Angry Birds. The Conrads are friends of my parents. Their son likes, soccer, Minecraft, and history. My son likes soccer, Minecraft, and history. SO they immediately started talking. Late the night before, we had looked at the calendar and realized that there were only two days remaining in our Dallas stay–with business commitments filling both. We also remembered promising our kiddos two things–The American Doll Store and Legoland. How were we going to fit everything in? Both places opened at 10:00 in the morning, so we couldn’t just “hit them early and move on.” We decided the only way was to go Sunday afternoon with the girls heading to The American Doll Store, and the boys heading to Legoland. Our friends Erin and Thomas and helped us out by lending us a car and coming along. The boys and the girls took separate paths. Our car pulled right–right into The American Doll Store and pink and dolls and a doll hair salon, and a $300 doll car. The boys car pulled left–towards Legoland and 3-D movies, and rides, and cars, and buildings, a $300 dollar Star Wars Lego set. Both girls had Christmas + Birthday money to spend. They had both worn out their American Doll catalogs figuring out exactly what they could afford. We decided to walk around before finalizing our purchases. A girl was having her birthday party at The American Doll Store, and it appears that her whole class was invited. All of them were having their doll’s hair done. Back at Erin’s and Thomas’s, the kiddos got out their new purchases, while the adults visited. This T-shirt is the T-shirt that Baseball Boy always wears under his Sunday-Go-To-Meeting button down. Then the second after the last “amen”, the button-down and tie come off, and he is wearing his favorite T.
Both Thomas and Scout had birthdays that needed some celebrating with some Texas sized portions of some Texas-rich, Texas chocolate sheet cake. Now this is the very cake that Scout had requested for her birthday! Happy Birthday Thomas. Happy Birthday Scout. And so ended our last full day in Dallas. Tomorrow there are loose ends to tie up, clothes to pack up, kiddos to load, and a few more boutiques to visit. Tomorrow we start our two-day drive home to Michigan. This entry was posted in She said... and tagged american doll store, legoland, texas sheet cake. Bookmark the permalink. I will have to ask her! Good for you for getting your boys into a tie! My boys think a polo is torture and a button down is almost unbearable. I first question I get asked when we walk in the door is “Mommy, can I change pleeeeeeaaaaaassssse?! We try and require ties in the winter months, but just use polo shirts in the summer months. That is my version of fair–they learn how to wear a tie, but aren’t tortured year round.